Since the beginning of May 2016, the U.S. Dollar Index has been on an uptrend and making bullish chart pa. It got a fresh boost in November with renewed conviction in an imminent Fed Fund rate increase. Also, fueling the rise is a greater possibility of fiscal stimulus, which would expand the U.S. economy. However, former has more real impact than later. Rising Fed Fund rate has a direct relationship with stronger dollar. Stimulus has greater probability of adding to deficits and stronger dollar would worsen the balance of payment. Both of these forces weaken the dollar. The U.S. dollar has been in a long term down trend. 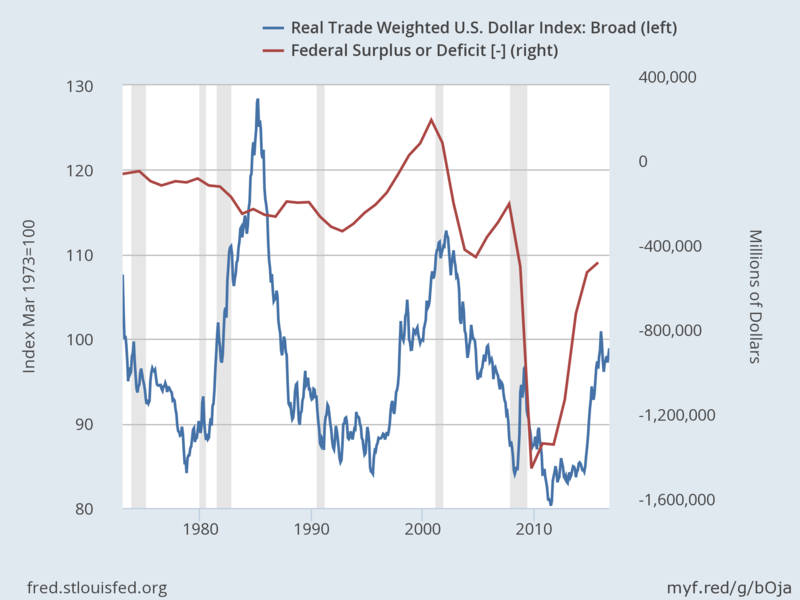 In May 1985, the Real Trade Weighted U.S. dollar index reached a maximum of 128.437. This resulted in the Plaza Accord between the governments of France, West Germany, Japan, the U.S.A. and the U.K. The result was a sharp decline in the index which lasted till July 1995. The index then rose till April 2002, which coincided with a decrease in federal deficit (red line in the Chart 1), which was leading the dollar index. The index declined, mostly, from 2002 till June 2011, with a brief rise from April 2008 to March 2009. The federal deficits were increase (falling below zero in the chart) during this time. The federal deficits started to improve after 2009 and since 2011, the index has been rising (Chart 1 is up to October 2016). One of the reasons for this rise is the increasing odds for a Fed-Fund Rate hike in FOMC’s December 14 meeting. 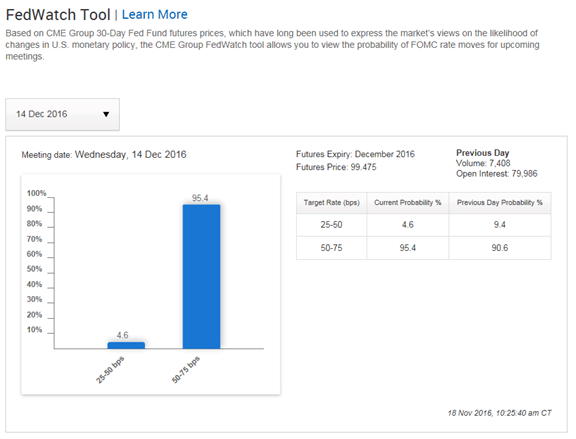 On November 4, the probability of Fed raising the benchmark rate by 25 basis point was 71.5%. On November 18, the probability had increased to 95.4 (Fig. A). During this time, the dollar index (DX #F), which tracks Fed’s index very closely, rose from a November 4 close of 97.088 to November 18 high of 101.535, 4.58%, which is significant in currency trading. On monthly chart (Chart 2), the index fell from a high of 128.18 in 1985, to a low of 78.43 in September 1992. The subsequent rise, from April 1995 to July 2001, took the index to 76.8% Fibonacci retracement level of the decline of 80s and ’90s. From 2001 to April 2008, the index declined, reaching new lows. The bounce from that low found a resistance at 38.2% Fibonacci level in March 2009. From that time till October 2014, the index formed a symmetric triangle. One touch point of the triangle was the low of 72.86 in May 2011, which was very near the low of 71.05, in April 2008. Dollar index broke above the triangle in October 2014. The approximate height of the triangle is 15.50 points. The approximate breakout point is 86.00. this gives us a target near 101.50. In March 2015, the index made a high of 100.785, which is very close to our triangle breakout target. The dollar index has been trading within a rectangle box since January 2015 (Chart 3). The upper limit is bounded by 100.785 to 100.600. The lower limit is bounded by 92.52 and 91.88. The height of this chart pattern is between 8.905 and 8.08. With a fresh up leg starting from November lows, the index is attempting to break above the pattern. If the break out is successful, odds favor it, then the target would be near 108.68 and 109.69. On monthly chart, (Chart 2), the rectangle box is following a rally from 72.860, the low of 2011 to 100.785, the high of 2015. This is formation is a flag, which usually occurs in the middle of a move, either up or down. If this plays out according to text-book then the target is near 119.805. A move like that will upset many apple-carts around the world. However, it also has built-in mechanism to keep the upheaval to a minimum. Stronger U.S. dollar will enable more imports into the U.S.A., which will worsen it balance of payment. 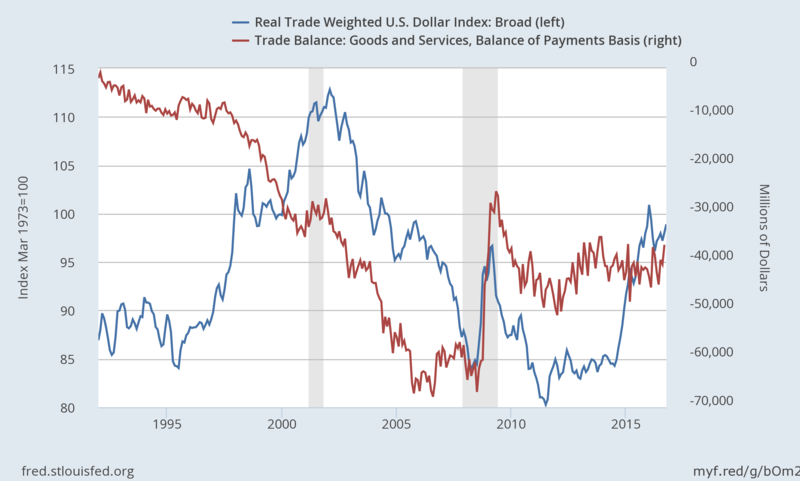 The Trade Balance has led the U.S. dollar quite closely since 1992. Worsening balance of payment (BoP) usually leads to weaker dollar and strengthening BoP to stronger dollar.